of the American and British Armies in twelve great battles of the American Revolutionary War. You'll feel the battles come to life as the American militia and continentals face the feared British elites as each try to hold the line at the battles of Long Island, Harlem Heights, Weitzel's Mill, Trenton, Hobkirk's Hill, Eutaw Springs, Bemis Heights, White Plains, Kings Mountain, Brandywine, and the double scenario covering the morning and afternoon battles at Monmouth. Uses Clash for a Continent game system. As British leaders you've told the American patriots to lay down their weapons or you'll lay waste to their lands. And as the Americans you have pledged your lives, fortunes and sacred honour in defence of all you value. 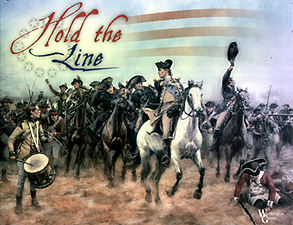 Take the role of British generals Howe, Burgoyne, Cornwallis and others as you stake your reputation on defeating the rebel armies. And as American generals Washington, Greene, Gates and others as you've precariously placed your army in their path where the outcome depends on your decisions... The enemy approaches, the sound of cannon deafens, men shout commands, smoke fills the air, can you HOLD THE LINE!